Home > Used Vehicles > 2017 GMC Sierra 3500HD Denali,AWD,6.6 LITRE DIESEL,LEATHER,SUNROOF,NAVIGATION,6 INCH LIFT,BLUETOOTH,BACK UP CAMERA, LOCAL TRADE AND A MUST SEE!!!!!! 2017 GMC Sierra 3500HD Denali,AWD,6.6 LITRE DIESEL,LEATHER,SUNROOF,NAVIGATION,6 INCH LIFT,BLUETOOTH,BACK UP CAMERA, LOCAL TRADE AND A MUST SEE!!!!!! Cylinders: 6.6L V8 32V DDI OHV Turbo Diesel - 8 cyl. Hot Deal! We've marked this unit down $2000 from its regular price of $65900. 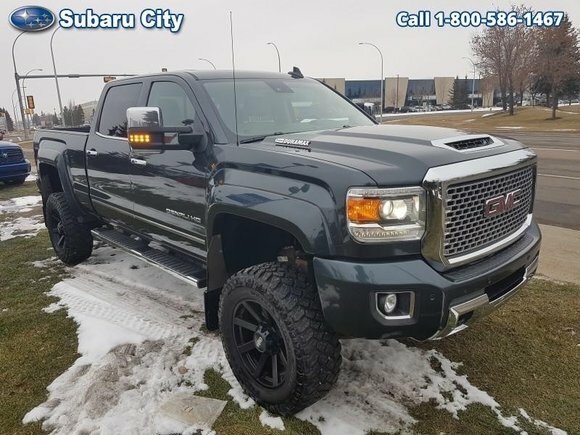 This 2017 GMC Sierra 3500HD is for sale today in Edmonton. Nearly two-thirds of the 2017 Sierra 3500 HD cab structure is made from high-strength steels. Becuase of this, it's a fortress of strength that contributes to the Sierra's ultra quiet cabin. GMC also uses high-strength steel in a fully boxed frame to improve ride quality and limit the amount of flex when pushed to the limits. The impressive precision finish of the 2017 Sierra 3500HD leaves no doubt as to exactly what it's made of.This sought after diesel Crew Cab 4X4 pickup has 103250 kms. It's dark slate metallic in colour. It has an automatic transmission and is powered by a 6.6L V8 32V DDI OHV Turbo Diesel engine. Buy this vehicle now for the lowest bi-weekly payment of $411.60 with $6793 down for 84 months @ 5.99% APR O.A.C. ( taxes included, $790 Administration and Secure Ride included / Total cost of borrowing $13779 ). See dealer for details. Want to try the 2017 GMC Sierra 3500HD Denali?